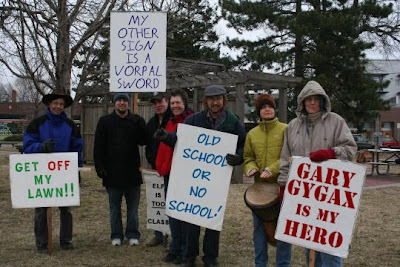 (CNN) A pack of protesters gathered at the village park in North Hakenslach, Minnesota this morning, braving the frigid weather to stand up for the rights of, as one protester put it, "old school gamers everywhere." The seven people, each one hailing from different locales such as Texas, Chicago, and even as distant as Ontario, Canada, carried signs, beat a drum, and shouted pro-"old school" slogans to show their solidarity, and to raise awareness for their cause. "People need to be made aware that there are more of us around than they think," said Jim Grognardi, the group's unofficial spokesperson. 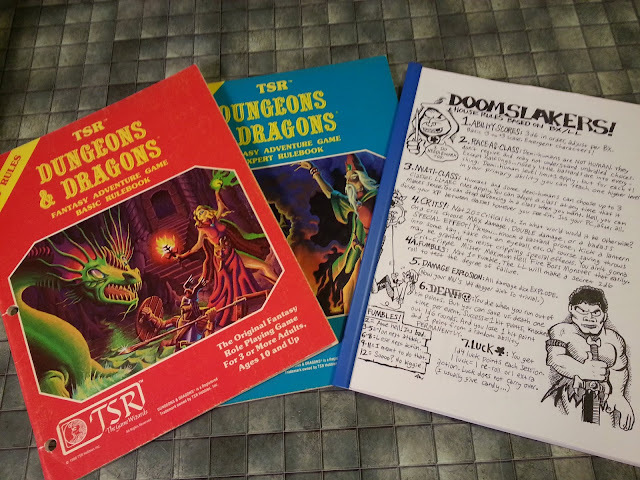 "Beneath the thin veneer of today's gaming populace is a much larger, much older foundation of gamers, and we demand that our voices be heard." Although the protest group consisted of only seven members, Grognardi claimed that many more like-minded individuals had indicated that they would be arriving to join the protest. "We're expecting about another 130 people," Grognardi maintained. "Get a life, weirdoes!" he exclaimed as he sped by. THIS is now my wallpaper :) You rock. I like the one small sign in the back on the ground: "Elf is TOO a class! Tee-hee. Thanks for the fun! Nerds unite. Awesome!! Cool blog.